The new Sharpdome technology included in AXIS Q61 Series provides full scene fidelity and sharp images in all directions - above as well as below the horizon. These compact PTZ cameras are suitable for indoor and outdoor installations, in low light and challenging conditions, making them ideal for a range of applications such as shopping malls, open parking areas and stadiums as well as city and perimeter surveillance. Axis' Sharpdome technology with its innovative me- chanics and unique dome design provides sharp images in all directions. It offers the unique possibility to iden- tify objects as much as 20° above the camera horizon making these cameras suitable for uneven terrain. The Sharpdome technology includes Axis' unique Speed Dry function that will easily remove water drips from the dome glas and provide sharp images in rainy weather . 1080p and AXIS Q6114-E with HDTV 720p. Both models feature 30x optical zoom with autofocus. The HDTV resolution provides wide area coverage as well as detailed zoomed-in views. The cameras deliver smooth video with great detail at 50/ 60 frames per second that helps to identify incidents in scenes with fast moving objects. AXIS Q6114-E incorporates Lightfinder technology , allowing for extreme light sensitivity in low light con- ditions. The cameras offer Wide Dynamic Range - dynamic capture (130 dB) for challenging conditions where backlight or intense contrasts are an issue. 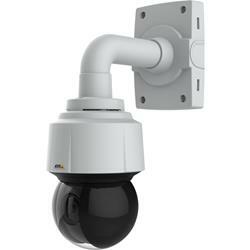 AXIS Q61 cameras are among the market's fastest PTZ dome cameras. The quick and precise pan performance of over 700° per second makes it easy to quickly change viewing position and follow fast moving objects.